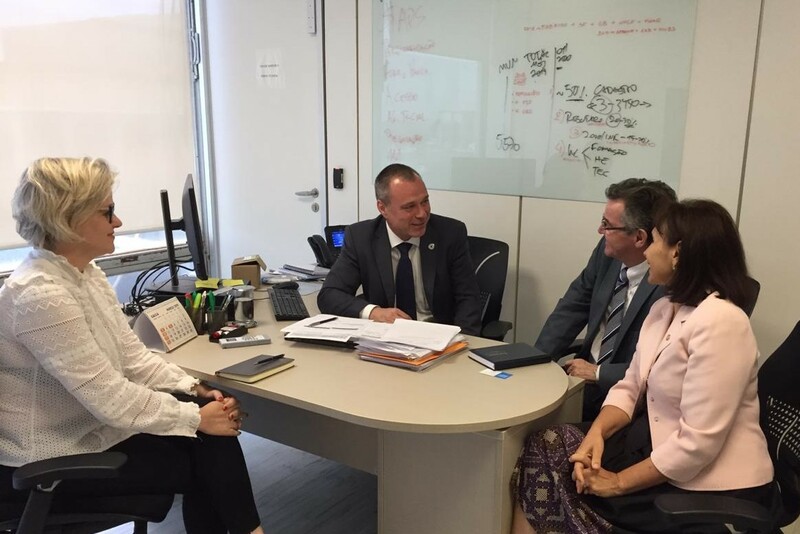 The first meeting between the Director of the Latin American and Caribbean Center on Health Sciences Information (BIREME), Dr. Diego González, and the Deputy Executive Secretary of the Brazilian Ministry of Health (MH), Dr. Erno Harzheim, took place in Brasilia on March 20, 2019, with the purpose of discussing the country’s technical cooperation with the PAHO/WHO Specialized Regional Center. Alongside Dr. González, Dr. Socorro Gross, PAHO/WHO Representative in Brazil, and Janine Coutinho, PAHO/WHO Brazil Knowledge Management consultant were also present. BIREME, fulfilling its mission of democratizing information, knowledge and evidence, and being located in São Paulo, Brazil, has been working with the MH in different areas for 52 years, in federal, state and municipal levels. This work occurs within the framework of the Cooperation Terms (CT) between the MH and PAHO/WHO Brazil. BIREME’s work is referred to specifically in CT93, oriented towards the strengthening and improvement of the Center and in which it is recognized as a PAHO/WHO Specialized Regional Center. At the beginning of the meeting, Dr. Erno Harzheim, a Family and Community Medical Doctor, manifested having been a user of BIREME’s products and services during his medical studies, and that he is certain he will keep close work with the Center, giving priority to actions aimed at strengthening Primary Health Care (PHC) in the country. Dr. Diego González presented the current structure of the Center, its institutionality and reinforced the presence of Brazil in BIREME’s Governance Committees, in its Scientific Committee as well as in its Advisory Committee, where the MH is a permanent member. He also showed the Center’s current priorities, which include, among others, PHC, the Sustainable Development Agenda for the Americas 2018-2030 (ASSA 2018-2030), the development of information products and services directed to final users, training as a priority work axis, and the importance of networking for achieving concrete results. During his presentation, Dr. González emphasized BIREME’s work with the Virtual Health Library (VHL) in Brazil, where the MH plays a key role in leading the network of cooperating centers in the country. He also showed a few of the products destined to facilitate information access, such as eBlueInfo, MyVHL, and the Knowledge Showcases, among many others. Dr. Socorro Gross, PAHO/WHO Representative in Brazil, reinforced the importance of this type of products, which organize information in a practical way for primary care health professionals and also for the selective dissemination of information according to thematic axes of the users’ interest. Dr. Erno Harzheim presented in a general manner the main axes, as well as the priorities of the MH, such as the PHC attributes, the focus on family health and common diseases. He emphasized the need of producing protocols and materials as well as objective, concise and practical documents aimed at health professionals. BIREME may play an important role in providing visibility to that type of information, making it accessible and easy to use. According to Dr. González, “the meeting was very productive and other virtual meetings were planned, which are to occur soon in order to define the necessary actions for BIREME, within the framework of its technical cooperation with Brazil, for strengthening the lines of action mentioned by the Joint Executive Secretary”.